﻿ Handy Library Manager, catalogue library materials in multiple languages, Unicode support. Help, how to topics > Unicode support, different languages? Data entry in all major written langauges. Handy Library Manager supports Unicode (UTF-8), an international encoding standard. The implementation of the UNICODE standard lets users to catalogue library collections in all major written langauges. Catalogue your library materials in Hebrew, Arabic, Hindi, French, German, Chinese, Polish or in any other language. Main library catalogue with the item entered in Chinese language. Main library catalogue with the item entered in French language. 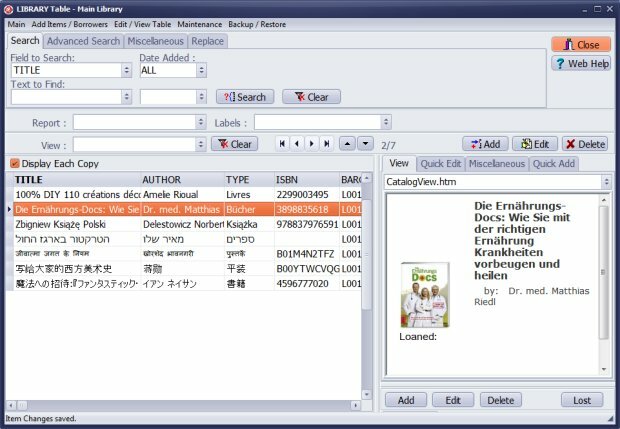 Main library catalogue with the item entered in German language. Main library catalogue with the item entered in Hebrew language. 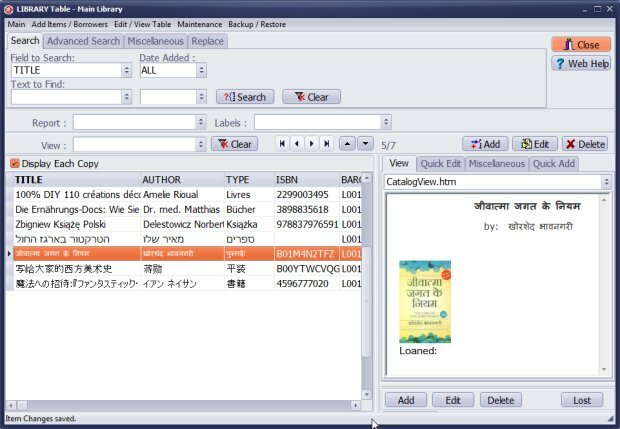 Main library catalogue with the item entered in Hindi language. 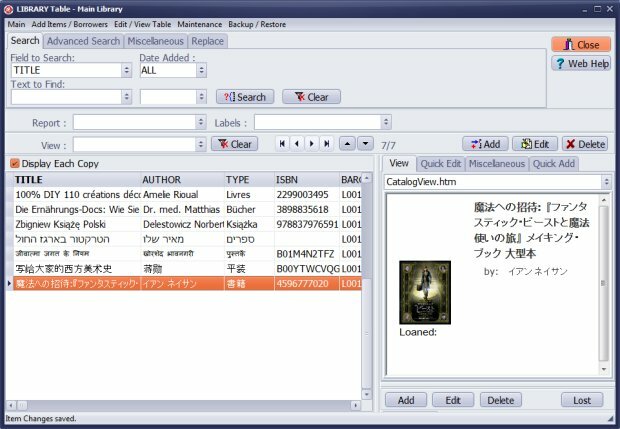 Main library catalogue with the item entered in Japanese language. 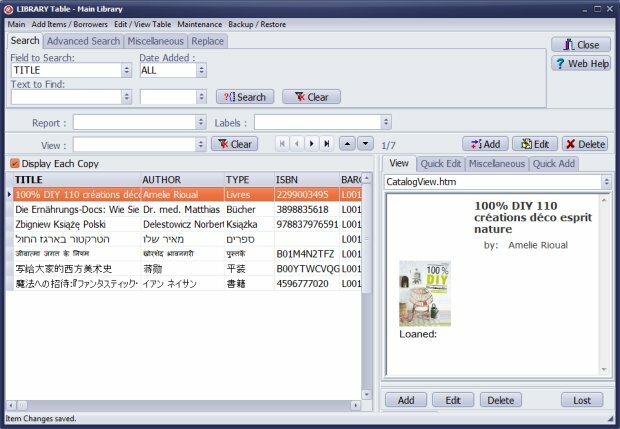 Main library catalogue with the item entered in Polish language. Questions: Library software with Arabic entries. Hello! We are a church in the Middle East and therefore our library has not only English, but also Arabic titles. Is the Handy Library Manager software Unicode and compatible with Arabic script? Can we type from right to left? Thank you for informing us, because we wouldn't like to buy your product and discover we cannot use it for our Arabic collection. Answer: You can catalogue your library collections in English and Arabic. Before you buy you can download and test our software. Questions: Does your library software display Greek characters in data fields? Answer: You can enter library materials in Greek. Questions: I am looking to buy the Handy Library Manager for the Bible College, we are missionaries in Albania. Most of our library material are in English, but want to begin adding books in Albanian. Is this possible, to have books in English and in Albanian? Answer: You can manage library items in both languages, English and Albanian. Question: When I have 5 books to add to main catalog, I have to manually since these books are in Korean. I cannot utilize auto catalog. And these books are written same author and published by same publisher. Only difference is the titles. Is there a way I can use same information when I add these books. I don't have to type same author, publisher for each book? Answer: You can use the Copy Selected Item command.